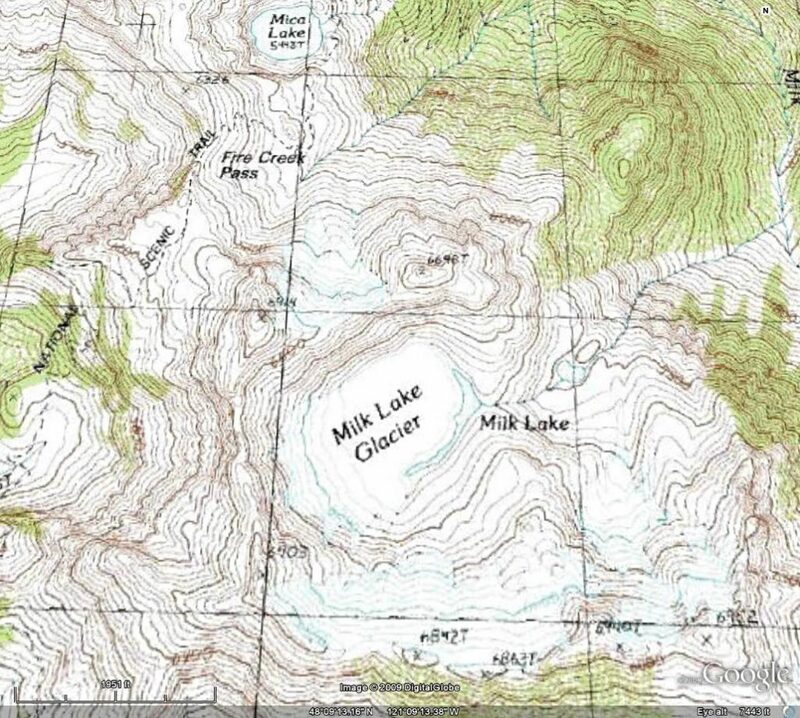 In the USGS map for Glacier Peak in the North Cascades, Washington based on 1979 aerial photographs, Milk Lake Glacier fills most of the Milk Lake Basin, with just a fringe of water seen. The glacier had an area of 0.24 square kilometers at this time.The flat topography over the lake indicates a very thin unstable glacier area. 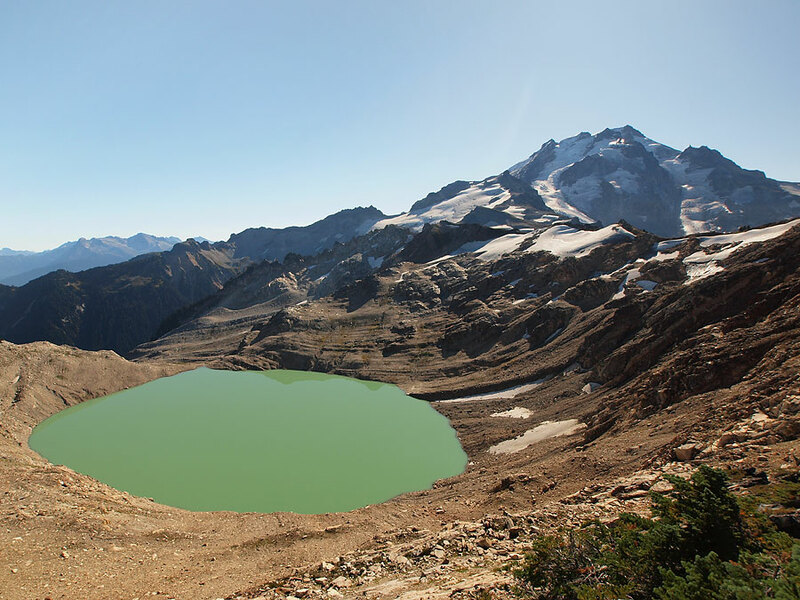 By 1988, Milk Lake had formed, a notably circular new alpine lake, the former glacier ice still filled part of the lake as ice bergs. In visiting the glacier in 1988 I was surprised at the expansion of this formally small lake. The glacier had retreated to the margins of the lake fringing the west side of the lake. The fringing ice was clearly thin, we found several crevasses that reached bedrock 5-10 m down. In 1994 on a return visit in miserable weather, there was no longer any icebergs in the lake and the lake was more of a jade to turquoise color. The fringing ice had lost about half of its area since 1988. This glacier remnant was not going to last long. By 2006 the glacier was gone entirely even the fringing elements. One less glacier, one more alpine lake, a gorgeous green colored lake now. Milk Lake Glacier left 1979 based map. 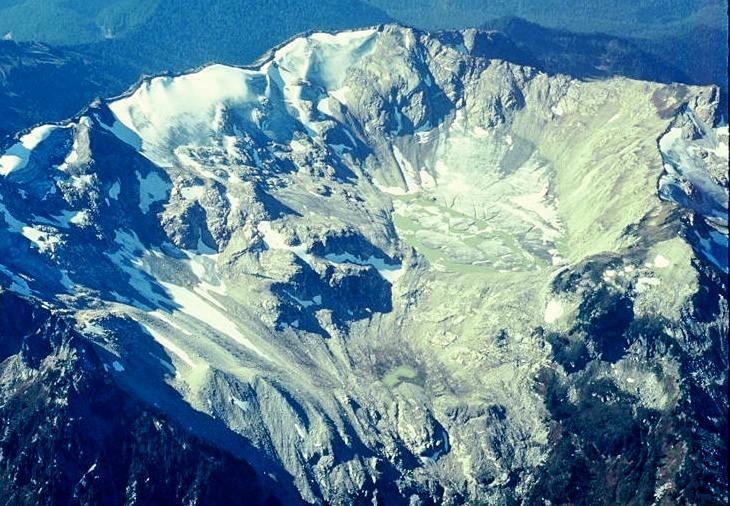 Above 1988 photograph of Milk Lake Glacier. 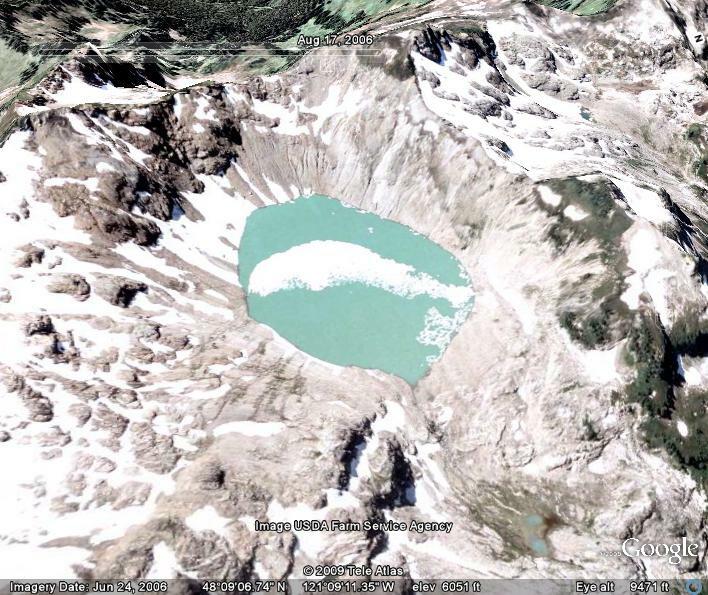 At bottom right 2005 Google earth image of Milk Lake, without any glacier left. Below left in 2009 is a picture of the basin that used to host the glacier. The lake would not be called Milk Lake now.